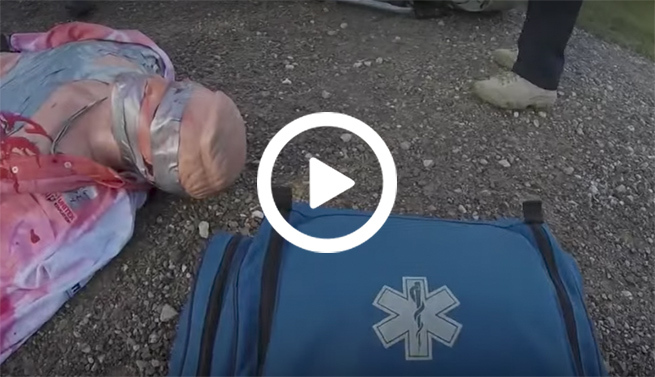 Mass-casualty simulation prepares EMTs for real world scenarios. The second annual, mass-casualty simulation, Operation Urban Rescue, was a massive achievement for the numerous agencies involved, which included Unitek. Hundreds of personnel swarmed the scene to provide emergency care and manage the incident. In the early hours of the day, agencies gathered to plan their response. After SWAT teams secured the primary insurgent threat, HAZMAT teams moved into the blast area and created a perimeter around the surviving victims. Decontamination response units worked quickly to suit up and start assessing patient needs, prioritizing urgent care, and moving victims through decontamination procedures. Patients were moved from the decon units into medical tents for immediate care. While victims and bystanders started first aid, rescue personnel continued the search for trapped victims in mangled rubble and smashed cars, ripping off car doors and sawing through concrete debris. EMTs worked alongside paramedics to stabilize patients and identify critical injuries for immediate transport or airlift. Ambulances and helicopters worked in conjunction to move patients to hospitals where medics, nurses, and doctors scrambled to handle the constant flow of wounded patients. At the end of the operation, the insurgents were neutralized, wreckage had been cleared, and hundreds of patients had been triaged, treated, transported and “saved.” After hours of planning and hard work, Operation Urban Rescue succeeded providing a real-world training experience for every member of the twenty plus agencies involved. Responders assessed the situation, responded to critical medical emergencies, and coordinated with other agencies to secure the disaster scene and render care.